What are the year's best political ads for third party and independent candidates (so far)? Over the last week, I've viewed dozens of political ads and short videos produced by and for Libertarian, Green, Constitution Party and Independent candidates for office from Maine to California and Florida to Washington. Thanks to everyone who commented here and at IPR, and those who wrote in with suggestions and nominations! From this unscientific sampling of videos, it is safe to conclude that there are some very savvy and extremely creative ads out there, and probably many many more which I still have not seen. The state's Democrats and Republicans may soon be making way for Libertarians, Greens and, yes, perhaps even Pirates, after a federal judge in Nashville threw out the state's restrictions on placing party affiliations next to candidates' names on the ballot. This comes as political outsiders nationwide have been finding success against establishment candidates. The state's minor parties won't have access to the ballot this year, but third parties say the ruling will raise the profile of their candidates and their platforms. "This is a victory not just for our party, but for all Tennesseans," said Stephen Collings, a 5th Congressional district candidate who represents both the Libertarian Party and U.S. Pirate Party, which advocates international copyright reform. These "pirates" may be sailing against the tide, but they are riding a wave of popular opinion. A group of activists in their 20s who advocate modernizing the economy by "copying everything" are trying to register as a political party just as Russia tightens its anti-piracy policies in a bid for membership in the World Trade Organization. The Pirate Party of Russia, which claims 15,000 registered online supporters, decided this month to apply for official party registration with the Justice Ministry. The so-called pirates will need to gather at least 45,000 signatures by March 12 to meet the government's criteria ― though that is little guarantee of state recognition. Some Georgia Libertarians with a bully pulpit are savaging Republican Governor nominee Nathan Deal and helping his Democrat opponent, Roy Barnes, in the process. In their minds, it’s for the greater good — a chance to legitimize and make official the Libertarian party in the state while punishing Deal for beating their favored Republican candidate in the run-off. If the choice is between Republican Nathan Deal, along with his Nazi sympathizers, and Libertarian John Monds, well, the choice is easy. Fifty-five percent (55%) of all voters say they have voted for an independent candidate in the past. Forty percent (40%) have not. . . .
one-out-of-three Likely U.S. Voters (33%) say they are more likely to vote for an independent candidate in this election than they have been in the past. . . .
Thirty-seven percent (37%) of GOP voters say they are more likely to vote for an independent candidate this November, compared to just 17% of Democrats. Perhaps not surprisingly, 47% of those not affiliated with either major party are more inclined to vote for an independent. Politico: Colorado "GOP Becoming Third Party"
The implosion of Colorado gubernatorial candidate Dan Maes is becoming so apparent that it’s likely to leave the Republican nominee finishing in third place on election night. It’s an embarrassing and disheartening prospect for a party that just months ago believed it had an even shot at taking over the governor’s mansion in the Rocky Mountain State. Democrat Andrew Cuomo and Republican Carl Paladino are not the only choices for Governor of New York. There is also a Freedom Party ticket featuring a Lieutenant Governor candidate from Buffalo. She is retired long-time Buffalo Public Schools teacher Eva M. Doyle. She's the running mate of Charles Barron who is currently a New York City Councilman. The Freedom Party has roots in 1960s Mississippi . . . POLL: HICKENLOOPER 44%, TANCREDO 34%, MAES 15%: A Fox News poll released yesterday found that Democrat John Hickenlooper has 44 percent of the support, third-party candidate Tom Tancredo has 34 percent support, and Republican Dan Maes has 15 percent of the support in Colorado’s gubernatorial race. While the poll shows Hickenlooper still has a sizable lead, Tancredo is polling better than he ever has in the race. Dan La Botz, the Socialist Party candidate for the U.S. Senate, will join hundreds of thousands in Washington, D.C. on October 2 in a rally for jobs, peace, and justice. The Cincinnati school teacher, however, will be marching to the rally with a Socialist Contingent sparked by his campaign and endorsed by other socialist organizations as well as prominent activists and intellectuals throughout the country. La Botz’s call for his Ohio supporters to join him in Washington sparked the Socialist Contingent subsequently joined by many other groups and prominent individuals from around the country. Among the endorsers of the Socialist Contingent is Cindy Sheehan . . . The Socialist Contingent, says La Botz, will be carrying signs calling upon Congress to create “Good Jobs for All,” “Tax the Rich,” “Fight the Right,” and “End the Wars: Out Now.” And, unlike the organizers of the rally, says La Botz, he and the others in the Socialist Contingent won’t be calling on people to vote for the Democratic Party on November 2. “The Democratic Party’s national, state and big-city leadership and its neoliberal policies have betrayed the Democratic Party rank and file,” said the longtime activist. CT: Green Deshefy Blasts Democrat and Republican Rivals of Benefiting from "Legalized Bribery"
Green Party Candidate For The Second Congressional District, Scott Deshefy Said Today That Congressman Joe Courtney And The G.O.P. s Janet Peckinpaugh Are Supporting "Legalized Bribery" With The Current Big Money In Politics System. Deshefy said "The corporate money and special interests that have bought and paid for the Democrat and Republicans Party are bribing politicians, but legally, in a broken system that neither corporate party wants to reform. Citing the non partisan "OpenSecrets.org", Deshefy points to a career $2 million Political action committee (PAC) donations accepted by Courtney in just four years. Deshefy said "General Dynamics, Real estate, finical interest and huge lobbying interests all want some thing for their big money to Courtney". "Open Secret" also points to fundraiser after fundraiser for Courtney for $5,000 a plate" Deshefy said. He added "Who can give $5,000 to a Congressman and not want something back? Not the average Second District voter, but people from out of the state in New York, Texas and California who want to bribe Courtney legally "
Deshefy called for "Clean Elections" or public financing of Congressional races. He added "All issues pale in comparison to this, because we can not have fair discussion and debate, when the races have special interests paying for them. Deshefy call the G.O.P. s Janet Peckinpaugh "clueless on the money issues of campaigns". He added "She is asking for millions from out of state donors and does not back "Clean Elections", unlike her Republican Governor Jodi Rell. Peckinpaugh wants the broken money system to go on, just bribing the G.O.P. side!" The Green Party candidate for governor says Illinois should let people go to college free of charge. Rich Whitney calls it an investment in the people of Illinois. He compares it to the G.I. Bill that provided college educations for World War II veterans. In an interview Monday with The Associated Press, Whitney said . . .
News that five homes of well-known peace activists in Minneapolis had been raided and searched by FBI agents yesterday morning brought expressions of outrage from members of the Green Party´s state coordinating committee. They voiced support for the Anti War Committee and other local groups with which the activists are associated. They believe that accusations of material aid to terrorism are intended to intimidate all who protest. On Sunday September 26th four candidates for US Senate in Arizona squared off in a televised debate: Republican incumbent John McCain, Democrat Rodney Glassman, Libertarian David Nolan, and Green Jerry Joslyn. “As former Elko County Commissioners all of us, Nolan Lloyd, Tony Lesperance, Royce Hackworth and myself Brad Roberts, are supporting Janine Hansen for Assembly 33. She is a proven conservative we can trust. Elko now has the most liberal County Commission in history. Elko County has been plunged into debt---some $20,000,000! John Ellison has been a big part of voting for that unprecedented spending,” stated Brad Roberts former Elko County Commissioner. “That’s why we are endorsing Janine Hansen. She was named ‘Conservative of the Year’ in 2010 for her lifetime of work at the Legislature. She has attended every legislative session since 1971, campaigning for lower taxes, family values and other issues important to us all. She has a proven record we can count on,” continued Roberts. “I have known Janine Hansen for many years. She has never wavered from being a fiscal conservative and she is fiscally responsible. She has great respect for the taxpayer. These are qualities we are going to need in the upcoming budget session,” stated Tony Lesperance former Elko County Commissioner. “I don’t want an Assemblyman representing me whose idea of fiscal responsibility was to put me the taxpayer $20 million dollars in debt without giving me the opportunity to vote on it. What is worse is that the $20 million bond will take 20 years to pay off. It will take 5 commissioner terms to pay for the debt. That is not responsible government. Janine Hansen has been a true conservative and believes in accountability to the taxpayer. These are the qualities we need in an Assemblyman we send to Carson City during the state budget crisis,” stated Royce Hackworth former Elko County Commissioner. “As one that supports conservative values I support Janine Hansen. Having served with Mr. Ellison on the Elko County Commission I am concerned that he does not represent these same values,” stated Nolan Lloyd former Elko County Commissioner. “With nearly 18 years in public office John Ellison could be called a career politician. We are all aware that the State of Nevada has a serious budget shortfall. With Ellison’s record on spending, as a member of the Elko County Commission, we have serious concerns about him representingDistrict 33 in Carson City,” concluded Brad Roberts. I've had enough. Both letters to the editor on Sept. 18 contain valid points and prove that neither political party can be trusted. There are alternatives to Democrats and Republicans, but they receive very little if any coverage by major media outlets. One example is Rob Taylor of the Constitution Party. Mr. Taylor is running for the U.S. Senate. Rob is on the November ballot, yet has not been invited to join the debates between Ron Johnson and Russ Feigngold. Why not? Is it because the other parties don't want you to know there's another choice? Do the major print and broadcast media choose not to cover candidates like Rob because they know there won't be any large advertisement dollars from his campaign? The other problem is those who believe only well-known names can win. Are you betting on a horse race, or voting to elect someone who will represent you and do what is right for Wisconsin? Albert Einstein defined insanity as "doing the same thing repeatedly and expecting different results." I have come to believe that the Democratic and Republican parties are just different sides of the same coin. And until we change how we think and vote, we will have the same results. I urge you to do your own research, form your own opinion. Go to robtaylorforsenate.com and be better informed come November. Both major parties have trampled the Constitution and lied to us. That's why I'm voting for Rob Taylor on Nov. 2, because any other vote just continues the corruption. FL-GOV: Democrat Alex Sink was Solicited to Run on Constitution Party Ticket? Alex Sink in 2010: I know she is running on the Democrat Party ticket but she was solicited to run on the Constitution Party ticket. Can be have a duo-party support for her in Florida ?? Friday night in St. Louis three of the four candidates who want to represent the St. Louis area in the third Congressional District took part in a public forum held at Forest Park Community College. The event was sponsored by the League of Women Voters. Congressman Russ Carnahan, a Democrat, was joined by Republican candidate Ed Martin and Constitution Party candidate Nicholas Ivanovich. It was announced at the beginning of the evening that Libertarian Party candidate Steven Hedrick could not be in attendance. Constitution Party Urges Members to Cancel NRA Memberships: Is the NRA a Democratic-Republican Party Front Organization? "It is the policy of the NRA NOT TO INVOLVE ITSELF IN "THIRD PARTY SITUATIONS." The NRA will not co-sponsor the Sheriff Mack event. Welcome to the Constitution Party of Indiana! One of the first questions you may be asking is why do we need The Constitution Party if we already have two parties? An overwhelming majority of our elected officials have routinely ignored constitutional limits placed on their power. As a result, there are now very few areas where government is not involved in our lives. Both major parties, in spite of their rhetoric, have routinely ignored the limits put in place by our Founding Fathers in the U.S. Constitution. Please visit our FAQ page to learn more. The John and Ken Show on KFI AM 640 radio in Los Angeles is the top "local" radio talk show in America and is, by far, the most politically influential radio program in California. It airs weekdays during drive time, from 3-7PM, in Southern California and is syndicated throughout California. The John and Ken Show has had a dramatic impact on elections in California over the years, including (to their ultimate dismay) being a major factor in the election of Arnold Schwarzenegger when he first ran several years ago. The outspoken positions of John and Ken on illegal immigration, California's economy and many other critical issues are right down the line with those of Chelene Nightingale. John and Ken Show listeners would, no doubt, be extremely receptive to Chelene Nightingale's "We the People" message. While John and Ken have expressed extreme disappointment with the positions on the issues propounded by the "elephant," Meg Whitman and the "donkey," Jerry Brown, they had been reluctant to allow Chelene Nightingale to be a guest on their program because they generally (though there have been notable exceptions) don't take so-called "3rd Party" candidates seriously. Well, apparently because of their deepening disdain for the choices offered by the above mentioned "major party" candidates for Governor of California, they have changed their minds and have decided to invite Chelene Nightingale to be on their show next Tuesday afternoon! Nominations: What are the Year's Best Political Ads or Short Videos for Independent and Third Party Candidates? For next week, I'm preparing a post that will highlight the year's best political ads or videos for third party and independent candidates for any office. I've already watched a few dozen videos in my first round of research – and there are some really good ones out there –, but there are likely many more that I'm not aware of or haven't been able to track down. So if you know any noteworthy ads or short videos for any third party or independent candidate this year, drop a link in the comments or send an email. The Morning Call devoted a half page elaborating why they are barring my campaign from their debate. The article did not address 1) why the Morning Call first offered myself an invite which I accepted back in June, then rescinded this offer and 2) the deficiencies in the poll, which are highlighted here. While I do respect an organization’s ability to invite or not invite candidates to their events, it is saddening to see this in a “free” press. However, it is important to remember that regardless of the skewed poll, what is apparent is the campaign has a lot more work to do to get the message out. I was invited by the Morning Call to take part in a live internet chat event next month, which I of course agreed to. There is a debate on Friday in Allentown, feel free to come out and attend!! Independent candidate for governor Lincoln D. Chafee hit his Democratic opponent Frank T. Caprio’s performance as state treasurer on two fronts Thursday — for rehiring the niece of a predecessor who had been fired for “inappropriate behavior” and for allegedly failing to take “proactive steps” to head off a crisis in municipal pensions. Boston Herald Headlines "Tim Cahill Camp Shocker": Shocking Innuendo or Shocking Ignorance? Treasurer Tim Cahill’s floundering gubernatorial bid suffered another huge blow last night when his top strategist quit, saying the independent candidate’s reluctance to attack his rivals has cost him the election and now is hurting Republican Charlie Baker’s chances. Many will recall that it became uncouth to refer to tea party activists as "tea baggers" once the definition of the latter slang term became more widely known. But what about "shocker"? Marsh, the Independent Party candidate on the ballot for governor, says "everybody who is receiving a paycheck'' should pay into the state coffers — even if it is only $100 per year — in order to close the state's projected budget deficit of $3.4 billion for the next fiscal year. . . .
Marsh rejected the views of those who say it is bad tax policy to impose a tax on the poorest residents. He pointed out that the state legislature has raised the cigarette tax multiple times — to the current level of $3 per pack — even though many poor people are smokers and are forced to pay the tax. The poor also pay gasoline taxes, Social Security taxes, sales taxes and other taxes. First, the Cutler Administration will develop and sustain the Maine brand, one that embraces everything about Maine, from who we are to what we sell. It is one of our most important assets and competitive advantages. Second, A centerpiece of the government restructuring plan that I proposed a few weeks ago is a new department in which we will consolidate the economic development functions that are now scattered all over state government. We will call it the Department of Commerce and Tourism. Third, I have called for a longer school year as a part of my education reform proposal. I also think that in a state where tourism and hospitality is the number one industry, we should make every effort to start our school year after Labor Day, and I will try to make that change all across Maine. Finally, I will give you the respect that you deserve as Maine’s number one industry. When I am Governor, you will have not just a friend in the Blaine House, you will have a tireless advocate and a staunch defender. A Cache County man is crisscrossing the state to let voters know there is another choice for U.S. Senate this fall other than the two major-party candidates. Scott Bradley is an independent business owner from Logan who has been involved in Utah politics for over 40 years. The former republican has served as a County Central Committee member, a Precinct Chairman, County Delegate, State Delegate, and State Central Committee member of the Republican Party of Utah. He made the switch to the Constitution Party to "better champion the Constitution." Scott Bradley is Constitution Party candidate running alongside Republican Mike Lee and Democrat Sam Granato. Bradley is a serious student of history who says his platform is the Constitution itself. "You're going to get more of the same if you elect either one of the other candidates," Bradley said. Libertarians Reach out to LGBT Voters: "Unlike Democratic and Republican Parties, the Libertarian Party Believes in Equal Treatment Under the Law"
Like abused spouses who keep returning to their aggressors, gay voters keep handing their votes to the Democrats who abuse them. The Libertarian Party (LP) wants to break this self-destructive behavior and offers LGBT voters a better alternative. LP Chairman Mark Hinkle said, "Exit polls indicate that Democrats get over 70% of LGBT votes in federal elections. Those voters must really love the Democrats' rhetoric, because they certainly aren't seeing any action. "President Obama and the Democrats had almost a year of complete control of the federal government: the Presidency, the House, and a filibuster-proof 60 votes in the Senate. They could have repealed 'don't ask don't tell.' They could have gotten rid of the Defense of Marriage Act. But they didn't do either of those things. That's a complete and total betrayal of all the promises they made to gay and lesbian voters for years. "After a carefully orchestrated failure in the Senate, the Democrats are now blaming Republicans for blocking the repeal of 'don't ask don't tell.' Of course, three Democrats just voted against it too, including Majority Leader Harry Reid. Reid claims he voted for procedural reasons, but the whole situation seems calculated to look like they're trying to help, while making sure they don't actually help." Unlike the Democratic and Republican Parties, the Libertarian Party believes that gays and lesbians deserve equal treatment under the law . . .
Libertarian Party: Republicans Should have Issued an "Apology to America" instead of "Pledge"
After an initial wave of partisan enthusiasm for the House Republicans' "Pledge to America," the inevitable backlash is cresting. "We're sorry, America. Sorry we grew the federal government budget from $1.7 trillion to over $3 trillion. Sorry we added $5 trillion to the federal debt. Sorry we . . ."
The Green Party of the United States has endorsed the One Nation Working Together march and rally in Washington, DC on Saturday, October 2 for "Jobs, Justice and Education" (http://www.onenationworkingtogether.org/content/main). Theresa El-Amin, national co-chair of the Green Party, will serve as the party's representative on the national steering committee of One Nation Working Together. The Green Party's liaison to the Peace Table will be George Martin, Wisconsin Green, member of the Green Party Black Caucus, and former national co-chair of United for Peace & Justice. LeAlan Jones is asking supporters to call NBC News so he can be included in an Oct. 10 debate on "Meet the Press." Republican Senate candidate Mark Kirk and Democrat Alexi Giannoulias are expected to appear on the show that day. The Green Party candidate for governor says Illinois should legalize and tax marijuana, but his opponents disagree. Green candidate Rich Whitney says Illinois could bring in about $300 million a year by taxing marijuana. CA: Green Senate Candidate Warns "Beware the Democrats"
“During the past week, Democrats in the U.S. Senate have been introducing legislation they know won’t pass like the DREAM Act in an cynical attempt to dupe supporters of immigrant rights into thinking that meaningful “immigration reform” is around the corner if they just keep voting this party back into power. But beware of the Democrats. They are not what they portray themselves to be. The Green Party candidate for U.S. Senate in Maryland has died after being hit by an SUV while riding her bike in Prince George's County early Sunday morning. Maryland State Police say Natasha Pettigrew, 30, died at Prince George's Hospital Center at 10:30 on Monday night. The Massachusetts Green-Rainbow Party’s Jill Stein for Governor campaign is racing to raise $125,000 by Friday 9/24 in order to qualify for 1-1 public matching funds. Jill Stein supporters have created a viral facebook event called “Clean Money Tidal Wave for Jill Stein” and are asking Greens and progressives across the country to donate and invite their friends. As of Thursday at 12 PM, the Jill Stein campaign has $96,162 in qualifying contributions towards the $125,000 goal. That means Stein needs $28,838 in contributions of $250 or less by 3 PM EST on Friday to qualify for at least $125,000 in matching public funds. Street politics arrived on September 11th this year. Every year since 2001, the focus of the day had been placed on the ceremonial commemoration of those killed in the attacks on the World Trade Center. This year, dueling demonstrations for and against the construction of the Park 51 Islamic Cultural Center turned Downtown Manhattan into a contested political zone. Only a massive police presence prevented the two demonstrations from clashing as passions ran high. It was as though nine years of pent up collective psychological repression had been unleashed in a few hours . . . The End of Consensus . . .
Dan La Botz, Ohio’s Socialist candidate for United States Senate, today charged the Ohio Newspaper Organization (ONO) and its corporate members with making illegal corporate contributions to Rob Portman’s and Lee Fisher’s Senate campaigns. ONO is a for-profit, business enterprise created by the eight largest newspapers in Ohio. These eight newspapers, the Toledo Blade, the (Canton) Repository, the (Cleveland) Plain Dealer, the Columbus Dispatch, the Cincinnati Enquirer, the Dayton Daily News, the Akron Beacon Journal, and the (Youngstown) Vindicator, are all profit-seeking corporations. Rob Portman is the Republican nominee for United States Senate in Ohio. Lee Fisher is the Democratic candidate. The Federal Election Campaign Act (FECA) prohibits corporations from making contributions or expenditures “in connection with” any federal election. 2 U.S.C. § 441b(a). “Contributions” and “expenditures” include “any direct or indirect payment ... or gift ... to any candidate, campaign committee, or political party or organization.” Id. § 441b(b)(2). The Federal Election Commission (FEC) has construed this broad prohibition to include sponsoring debates. In short, because of the potential for abuse and the risk that corporate money may skew electoral outcomes, it is illegal for corporations to sponsor, stage, or fund debates between candidates for federal office. Texas Libertarians are hopeful their message of personal freedom and limited government resonates with Texas Latinos. A modest gathering of individuals from a variety of backgrounds met in Austin on Saturday for the official launch of Texas Libertarios, a political action committee meant to rouse the interest of Latinos disenchanted with the current two-party system. 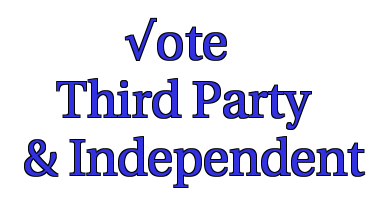 Over the weekend, I completed my final update to Poli-Tea's list of third party and independent candidates, 2010. The page now lists over 600 third party and independent candidates for governor, US House and Senate, from all 50 states, and links to over 500 campaign websites. And the list isn't even complete, though it is fairly comprehensive. Check it out. Former South Carolina State Legislator runs for State House, 37th District, as a Constitution Party candidate . . . Mr. Ralph Davenport, the owner of Davenport Glass Co., a conservative and former member of the South Carolina House, has switched from the Republican Party to the Constitution Party. After serving 22 years in the House as a Republican, he is now running for the SC House on the Constitution Party ticket. David Cobb was the 2004 Green Party nominee for president. The northern California attorney is now spending his time rallying citizens behind a grass-roots effort to reduce the power of corporations in America. MovetoAmend.org brands itself as a coalition dedicated to ending "the illegitimate legal doctrines" that prevent the American people from governing themselves. In anticipation of his multi-city visit to Florida that includes stops in Sarasota, Tampa and Pinellas County this weekend, CL caught up with Cobb last week. David Cobb: Let's begin by acknowledging that people from across the political spectrum, from the left to the right to the center, all agree that corporations have way too much power. We believe at www.movetoamend.org that it's even beyond the issue of corporate power. Unelected and unaccountable CEOs are ruling over us, they are literally making the fundamental decisions that affect our lives on a day-to-day basis. . . . The U.S. Senate candidate from the Constitution Party [Bernie DeCastro] had hoped to speak to a bunch of people who swear fealty to the U.S. Constitution and who will gather today in St. Augustine to celebrate the nation's founding charter at an event held under the headline “Forward With the Constitution.” But that candidate is not going to deliver his speech. In fact, he was rejected from even having a booth to meet the crowd that will gather at Francis Field, where a coalition of Tea Party activists from North Central Florida, including some from Ocala and Gainesville, will rally to celebrate the Constitution. [The League of Women Voters], along with Chicago's WLS-TV, is sponsoring an Oct. 20 debate that could feature other candidates, such as the Green Party's Rich Whitney, if they have 10 percent support in an independent poll. Downstate, the three candidates have verbally committed to an Oct. 14 debate, said Jak Tichenor, senior producer at WSIU-TV, the public broadcasting station in Carbondale. Other candidates for governor, such as independent Scott Lee Cohen and the Libertarian Party's Lex Green, will need 5 percent support in the polls to get in the debate. The debate will be broadcast on TV and radio. The can­di­dates for the Green Party and the Pirate Party (this is a real thing) for the 5th House Dis­trict want U.S. Rep. Jim Cooper and Repub­li­can chal­lenger David Hall to debate them. But the two major-party can­di­dates have ignored their entreaties for a month now, Green nom­i­nee John Migli­etta and Pirate nom­i­nee Stephen Collings, who flies the flag of the Lib­er­tar­ian Party in addi­tion to the Jolly Roger, say in a press release this morning. "The German Pirate Party has disclosed some secret documents on how the EU is planning to monitor citizens. The so called INDECT Documents describe how a seamless surveillance could (or should) be implemented across Europe. The use of CCTV cameras, the Internet (social networks), and even the use of UAVs are mentioned as data sources. Two of the nine documents can be downloaded from the German Pirate Party's website (PDFs in English)." The Teaparty Political Party Peg is running under is not the Tea Party... Teaparty Political Party in not the TeaParty....Teaparty Political Party in not the TeaParty....Teaparty Political Party in not the TeaPaTeaparty Political Party in not the TeaParty..Peg drop out stop this divide. Peg Dunmire is the Tea Party candidate for Congress in Florida's 8th congressional district. "Then having risked their blood they started us on the grandest experiment of liberty in history…the Constitution of the United States of America . "Let us all remember this day to whom we owe our liberties. "With that clearly in mind we must then pledge our lives, our fortunes and our sacred honor to rekindle the spirit of liberty in our blessed land." On September 13, 2010, the Hansen name appeared in an Associated Press article identifying people who owe money to the State of Nevada . “I ‘owe’ money to the State of Nevada in an on going battle with the Secretary of State over a ‘fine’ (civil penalty) imposed when I was a candidate in 2006. I wear this fine as a badge of honor—the price of defending liberty,” stated Janine Hansen candidate for Assembly District 33. “In this battle with the Secretary of State, I am standing on principle and resisting tyranny. Tyranny is not often recognized because it is the subtle subjection of liberty to unreasonable, bureaucratic and unconstitutional statutes,” continued Hansen. “Our forefathers ‘violated the law’ when they dumped tea in the harbor. Never-the-less we celebrate their courage and wisdom in their resistance to the tyranny of King George. Our battles for liberty today are just as real as they were in 1773 for the patriots who participated in the original Tea Party,” continued Hansen. “In the 2006 candidate reports, I replaced the secular affirmation ‘under penalty of perjury’ with a religious oath, which stated, ‘I do solemnly swear in the name of Jesus Christ that the foregoing is true and correct,’ and signed my name. To do otherwise would violate my religious beliefs because to swear is to call God as a witness,” continued Hansen. “The Secretary of State’s decision had rendered me to be incompetent to be a witness on my own campaign report because I used a religious oath instead of a secular affirmation,” stated Hansen. “The Nevada Constitution provides that Constitutional officers like the Secretary of State taking the oath of office may choose to swear an oath ‘so help me God’ or an affirmation ‘under penalty of perjury.’ So the Secretary of State’s own oath recognizes a difference between an oath (religious) or an affirmation (under penalty of perjury),” continued Hansen. “This all boils down to the fact that I have been assessed a fine of $15,000 for exercising my religious beliefs. How can that be in the land of the free and the home of the brave? Unfortunately, it is the case,” continued Hansen. “The Nevada State Senate recognized this travesty during the 2009 Legislature when upon my request they passed an amendment to the Secretary of State’s own bill allowing for a choice in taking a religious oath or secular affirmation when signing the campaign reports. AB 82 was passed by the Senate at 11:58pm on June 1, 2010 just after the Assembly had adjourned the Legislative Session Sine Die so the bill did not pass allowing the abuses of the Secretary of State to continue,” stated Hansen. I have attached below my original request for a waiver of this $15,000 civil penalty (fine) which was denied by the Secretary of State. I will not pay a fine that is imposed by government in violation of my First Amendment right to religious liberty or in violation of the Nevada Constitution’s protections of right of conscience, whatever threats, intimidation and public humiliation which the government may pursue. I stand with Thomas Jefferson, ‘Resistance to tyranny is obedience to God,’” concluded Janine Hansen candidate for Assembly District 33. Janine Hansen has been endorsed by the Tea Party Action is Brewing.